The origin of the Flushing River predates the Pleistocene Ice Age, when the Hudson River flowed into the Atlantic Ocean using the Harlem River and Flushing River streambeds. For thousands of years, the line between the planet’s northern ice cap and terra firma ran through Queens, creating a ridge of rocky deposits. The Hudson River then changed course, running on its present path on the west side of Manhattan. The former streambed remained as a low-lying salt marsh, with Flushing River as its outlet. On this wetlands map, the western tributary of Flushing River is Horse Brook. 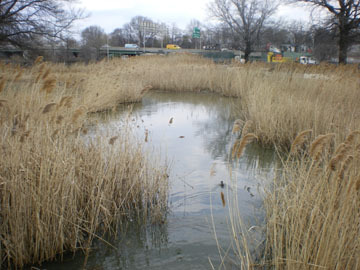 Its eastern tributary is Kissena Creek. Its northern tributary is Mill Creek, which later became the site of the short-lived Flushing Airport. Above left is an 1891 topographical map (Julius Bean & Co. atlas) of the Flushing River basin. Much of the landscape appears untouched since the Ice Age. 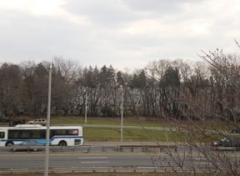 It is not easy to pinpoint the original source of this river because its location is buried beneath the tangle of highway ramps of the Kew Gardens interchange, where the Van Wyck Expressway, Grand Central Parkway, Jackie Robinson Parkway, and Union Turnpike cross paths. In colonial days, this location was known as the “Head of the Vleigh,” where the Queens Valley began, it lent its name to nearby Vleigh Place, which skews slightly off the grid. Today, only the local Young Israel synagogue hearkens to the area’s old name. This employees-only garden is located near the entrance to the Jamaica Yard, where the Queens Boulevard subway trains are stored. In the bushes around the garden, water seeps out of the ground and flows down to Flushing Meadows. The rail yard and a smaller DOT storage yard are in the background. 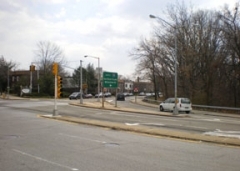 This is the Kew Gardens interchange, where the Queens Valley began. 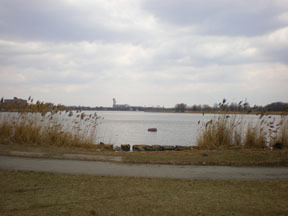 The source of the Flushing River is to the right of the photo. Queens Valley was also the name of a golf course that stood on the site of the Kew Garden Hills neighborhood until the late 1940s. 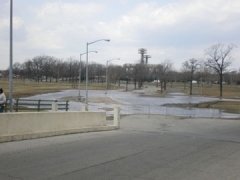 The stream is forming on the right shoulder of the Grand Central Parkway. The train trestle above the parkway connects the Queens Boulevard subway with Jamaica Yard. 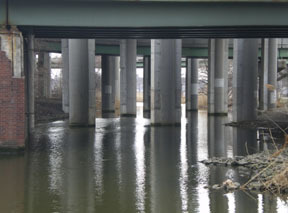 Drivers are familiar that the underpass below the trestle is often wet, even when there isn’t much rain. Looks like the DOT is taking note, and covering the shoulder to prevent erosion. 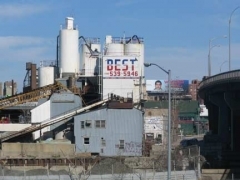 Jamaica Yard opened in the early 1930s, to serve the Queens Boulevard subway line, which connects to Manhattan’s Sixth Avenue, Broadway, and Eighth Avenue lines; and the Crosstown Line of Brooklyn. 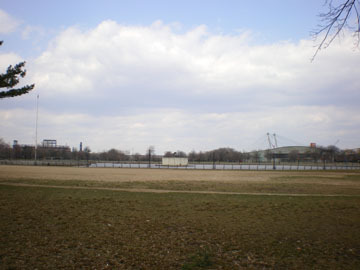 The yard was built on top of the wetlands where the Flushing River emerged. In 1939, the subway was extended towards Flushing Meadows for a temporary World’s Fair station. After the fair closed, so did the station. 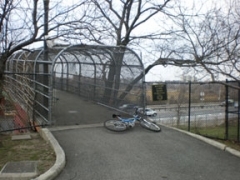 Its right-of-way was later used for the Van Wyck Expressway. Had the 1939 World’s Fair subway line (circled at left on a portion of a 1939-40 IND subway map) been kept in service, the neighborhoods of Queensboro Hill and Kew Gardens Hills would have received a one-seat ride to Midtown. Unfortunately, the Transit Authority bigwigs thought otherwise. With the exceptions of Hillside Avenue, Archer Avenue, and Downtown Flushing, the eastern half of Queens still does not have subway service. 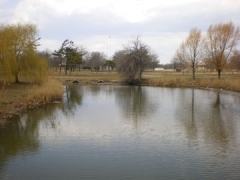 On the east side of the valley, the nascent stream widens to form the 47 acre Willow Lake. On the west side, a view of the valley in its natural state. On the horizon is the Pinnacle, a luxury apartment tower completed in 1989. 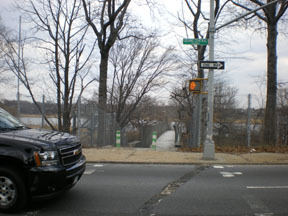 On the west side, the entrance to the Willow Lake natural area is fenced off. After the 1964 World’s Fair, the lake’s shoreline was used for baseball fields, but in 1976, it was restored into a natural area. On the east side, it is also fenced off. Yes, that’s my bike. Walking along the Flushing River would have taken forever. The natural area closed to the public in 2000, and is open once every few months for guided tours. Vandals and the homeless used Willow Lake as a refuge, and the city fenced it off to the public. The corner of Jewel Avenue and Park Drive East could make for a Greenstreets park. Between Willow and Meadow Lakes, Jewel Avenue travels on a narrow tongue of land. Here, the Flushing River appears as a canal connecting the lakes. It needs serious cleaning. 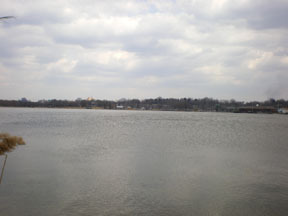 Meadow Lake is the largest freshwater lake in the city of New York. It was formed for the 1939 World’s Fair. At the time, an amusement area surrounded the lake. Included were the Coney Island parachute tower, and a “sun-worshipper” (ie. nudist) colony. This is a view looking north. On the horizon is the Jetson-esque NY State Pavilion, which was built by Philip Johnson for the 1964 World’s Fair. 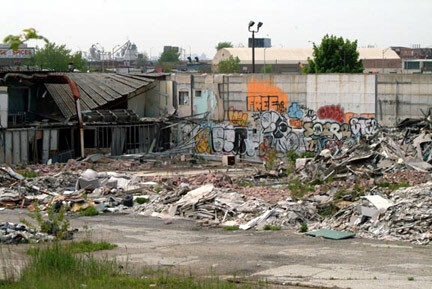 Today, it stands abandoned by the city and Borough President Helen Marshall (2008) wants it gone. The 1939 boathouse (one of the few relics from the 1939-1940 Fair) stands abandoned. 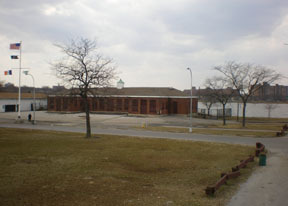 Throughout the decades, there have been plans to restore it, including a proposal for a Russo’s catering hall. Mount Hebron Cemetery stands on the site of the Spring Hill estate, where colonial governor Cadwallader Colden (1688-1776) was buried. His grandson, Cadwallader David Colden was born on this estate and later became mayor, congressman, and state senator. 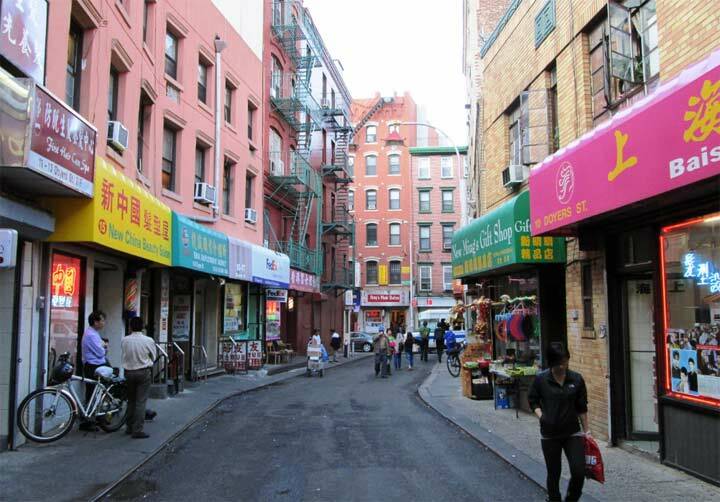 The Bronx’ Colden Avenue and possibly Flushing’s Colden Street are named for him. In 1894 the Cedar Grove Cemetery Corporation purchased the land, and later the Jewish community purchased most of the cemetery’s land. It is the resting site of my grandfather and uncle. It deserves a separate story of its own. Amid the marshes, Flushing River leaves Meadow Lake. The high water table keeps rainwater on the surface for a long time. In the back is Queens’ erstwhile Eiffel Tower, intended as a temporary structure, but still standing decades later. The photo at left is looking north. 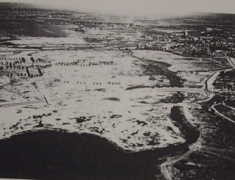 In this 1930s photo, Flushing Meadows is being prepared for the 1939-40 World’s Fair, and the wetlands hugging its shores have been buried. The twin bridges in the foreground are the soon-to-be demolished Strong’s Causeway (which spanned the Flushing River in the 19th and early 20th Centuries) and the newly-built Long Island Expressway. 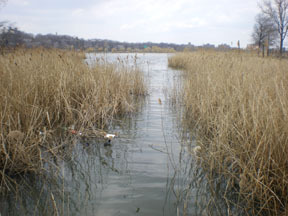 The upper part of the river was dredged to make Meadow Lake. 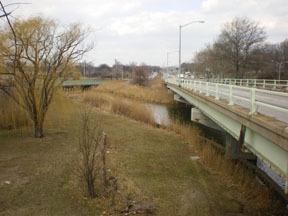 at right is a May 1936 photo of the Horse Brook meeting Flushing River. 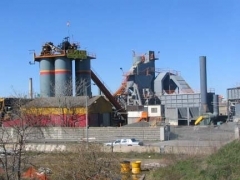 The huge dark heap is the ash dump. The neighborhood of Corona is on the left. ABOVE: Where Strong’s Causeway once crossed, the river is now spanned by a multitude of ramps. The river has been reduced to a green-colored canal. Left: For the 1964-65 World’s Fair, the upper portion of the Flushing River was buried beneath highway ramps and exhibition buildings. Since then, this is how the park landscape appears, minus the buildings. 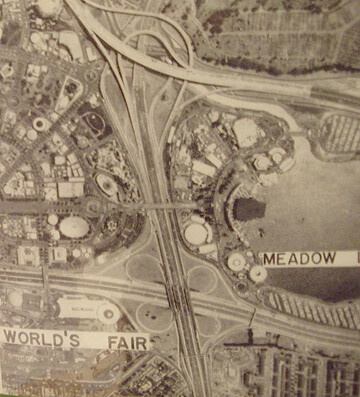 The river was diverted into tubes for the 1964 World’s Fair, and the ground above was used for exhibits. After the fair, it became soccer fields. In the background are the masts of the newly-opened natatorium. 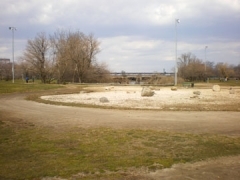 The Fountain of the Planets is a circular pool where the Kissena Creek once met the Flushing River. The bunker in the center of the pool stands abandoned. It once powered the fountain displays. Also in the background on the left is the new Mets stadium. In 1946, the nascent United Nations organization was holding its meetings in Lake Success, and proposals were being drafted for a permanent headquarters somewhere in the metro area. 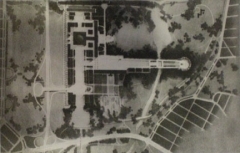 The proposal on the left capitalized on Flushing Meadows’ reputation as the 1939 World’s Fair site. It was designed by star architects Earle Andrews, Gilmore Clarke, Aymar Embury II, Wallace Harrison, and Louis Skidmore; and sketched by Hugh Ferriss. Thankfully, the diplomats preferred the Manhattan location, and Flushing Meadows remained the people’s playground. Had this proposal been carried out, it would be easy to imagine foreign consulates lining College Point Boulevard and diplomats residing in Corona. The Fountain of the Planets used 400 tons of water, shot out of 2,000 nozzles. The show was embellished with over 1,000 different parents of light. This pool of water was given an oval shape for the 1939 fair, and rounded some thirty years later. 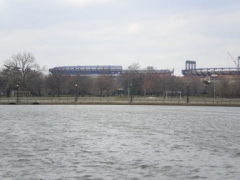 In the background is Shea Stadium, and the (your company here) Stadium, which will open in 2009. Among American cities, NYC has been a latecomer to the corporatizing of sports arena names. 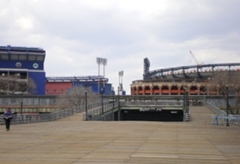 The streak was broken in 2000, when the Mets’ minor league team, the Brooklyn Cyclones were introduced to Keyspan Park in Coney Island. The Mets followed the lead, and for the next 20 years, the new arena will bear the name Citi Field, after Citibank. The pitch-and-putt golf course is relatively small by golf course standards, and is built atop the streambed, where there is a sand trap. In the background is the Porpoise Bridge. Built for the 1939 fair, this tidal gate bridge was built to protect the fairgrounds from the storm surges and salt water of Flushing Bay. Before the fair, salt marshes along the river absorbed the incoming waves. 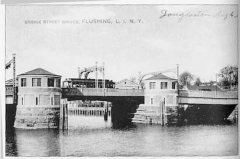 In F. Scott Fitzgerald’s “The Great Gatsby,” when Jay Gatsby traveled across the “valley of ashes” it was aboard the Port Washington LIRR line, which dams the river it is crossing. In the background is the double-decker Roosevelt Avenue Bridge. After the fair, there were also plans were drawn to annex the Willets Point junkyards and auto parts emporiums to the park, but the chop shops held on, as a result of efforts by lawyer Mario Cuomo. He later became a three-term governor. The only part of the plan that became reality was the round-shaped Shea Stadium. Above is a contemporary plan to turn the area into a business district and convention center. Don’t hold your breath. 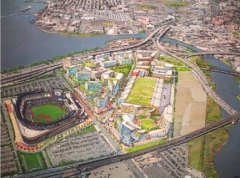 The only part of this image that is a reality is the new Mets stadium, which has been named after Citibank/Citigroup. It is a replacement for Shea Stadium. 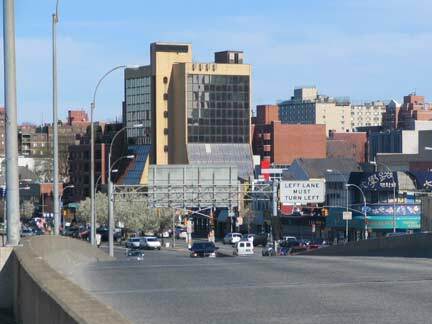 The Roosevelt Avenue bridge (upper left) was opened in 1928, with the upper level used by the 7 subway train, as it approaches its terminal at Main Street. 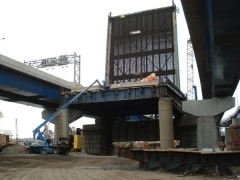 Initially, it was a drawbridge, allowing large vessels to pass underneath. The only other subway drawbridge in the city is the Broadway Bridge in upper Manhattan. 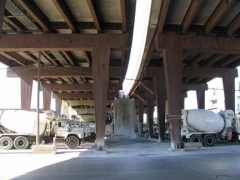 In the early 1960s, the Van Wyck Expressway was built atop the river, and under the bridge. The drawbridge’s control room was then abandoned permanently, and it became a fixed bridge. ABOVE RIGHT and LEFT: Charming tableaux along Roosevelt Avenue on the east bank of the Flushing. 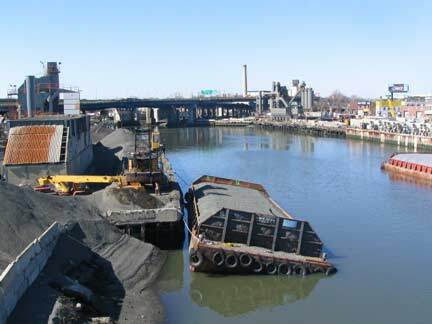 As part of the Whitestone Expressway Bridge replacement, the Department of Transportation is also replanting 2.5 acres of wetlands along the left bank of the river in the above photos, according to a recent Daily News article. 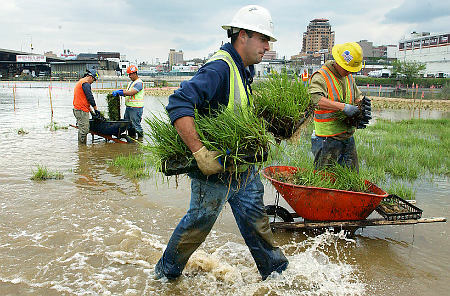 Under lead engineer John Elias, more than 90,000 native marsh grasses known as Spartina alterniflora were planted by hand along the lower tidal portion of the riverbank, with invasive plant species being removed. What a beautiful sight — nature being gently restored by hardhats! Above photos from FNY’s Flushing extravaganza, inclusing these views of the Flushing River and downtown Flushing from the Northern Blvd. bridge. Conditions on the pedestrian walk (accessible through two lanes of rushing traffic) have improved drastically from the mid-1990s when a rope separated the intrepid walker from a 20-foot drop into the weeds; a chain link fence has been raised. 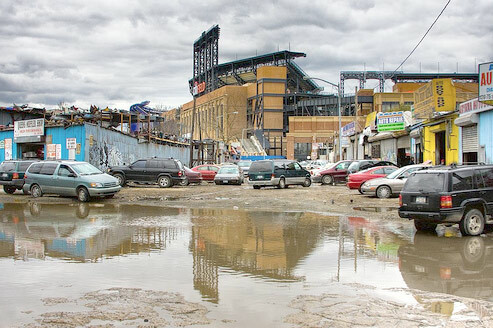 The mighty Flushing River is flanked by the junkyards and auto parts emporiums lining Willets Point Boulevard and the thoroughly impersonal College Point Blvd., whose highlight is Western Beef and Home Depot. Though upscale condos are sprouting on College Point Blvd. 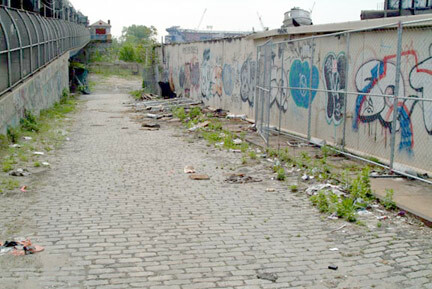 and 40th Road, it would take a miracle to create a San Antonio-style Riverwalk on the Flushing. 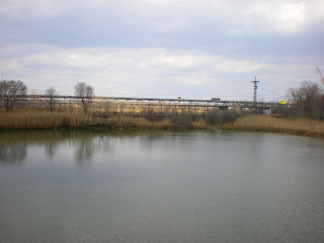 The river is used today by concrete barges. 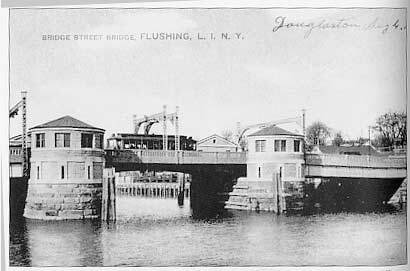 Forgotten Fan Ken Buettner: The 1906 span shown in the page was replaced by another drawbridge in the 1930’s when a sister drawbridge was built at the same time for the Whitestone Parkway (leading to the new Bronx-Whitestone Bridge). (That span, whose drawbridge mechanism was removed in 1963 and fixed in place, is currently being replaced.) It was the 1930’s span which was replaced by the current fixed bridge. The new bridge is higher and longer. This is the northernmost bridge over the river. It was originally built as a drawbridge for the Willets Point Boulevard in 1936, was soon appropriated for the Whitestone Expressway. The bascule drawbridge hasn’t been raised since the early 1960s. 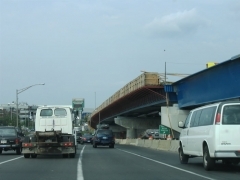 At this time, it is being replaced by a fixed span. 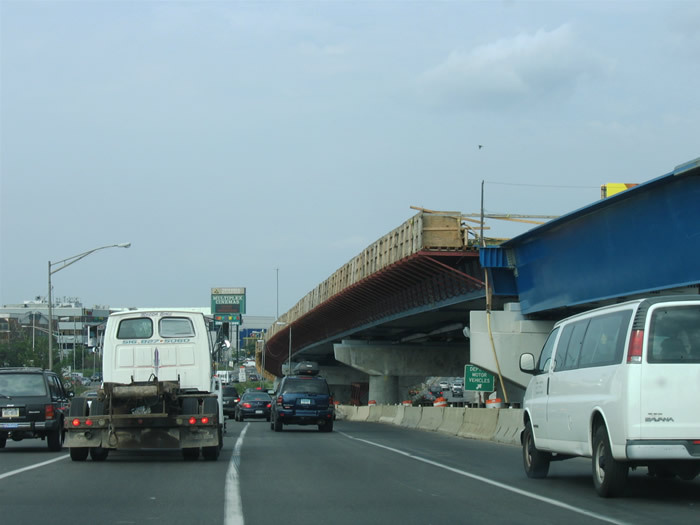 In early November 2008, the original bridge was raised for the final time, in preparation for its removal. 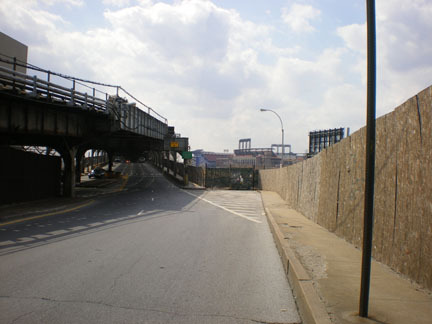 The only other interstate highway in the city with a drawbridge is the Bruckner Expressway spanning the Bronx River. Like the Whitestone Expressway Bridge, it was originally a boulevard transformed into a highway. The new fixed span flanks the old bridge on both sides. From here, the Flushing River curves to the west and empties into Flushing Bay, an arm of the East River, which itself is an arm of the Atlantic Ocean. 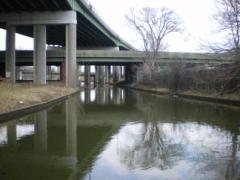 Thus ends our journey of the Flushing River and its tributaries. Forgotten NY contributor Sergey Kadinsky is tourguide for Grey Lines.